May 31, 2016, 12:57 PM · In an effort to promote the coverage of live violin performance, Violinist.com each week presents links to reviews of notable concerts and recitals around the world. Nikolaj Znaider performed the Beethoven with the London Symphony Orchestra. The Arts Desk: "So-called passage-work was simply gossamer spider-web leading from one strong idea to another. Znaider led the not too dreamy Larghetto out in to the light of a poised, ethereal dance, and made no meal of meaty rondo inspiration." The Guardian: "Charismatic Nikolaj Znaider was the soloist, sweet-toned yet assertive, elegant and forthright in his phrasing." Nikolaj Znaider. Photo by Lars Gundersen. Ji Won Song, Fedor Rudin and Minami Yoshida performed in the first session of the finals of the 2016 Montreal International Violin Competition. Violinist.com: "Minami Yoshida, 17, the youngest of the finalists, showed herself to be a powerhouse in her performance the Violin Concerto by Jean Sibelius." Erin Keefe performed the Brahms with the Minnesota Orchestra. Star-Tribune: "The performance was thoughtful and probing, with thrusting momentum and ample emotion, and it was supported at all times by Vänskä’s poised and magisterial accompaniment." Robert Waters performed Durant's Violin Concerto No. 8 with Music of the Baroque. 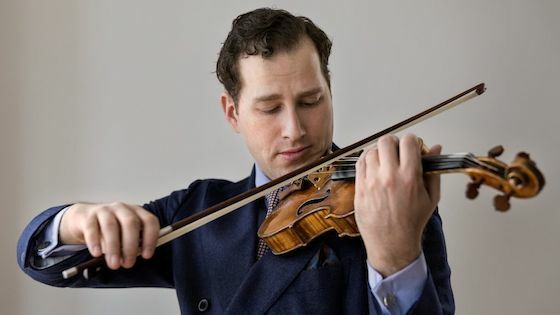 Chicago Classical Review: "Robert Waters, MOB’s excellent outgoing concertmaster had the majority of the solo moments Monday, though, oddly, the one work designated as a concerto for his instrument, gave him little to do."